They both have beaches in common, but what's different about Florida's Gulf and Atlantic Coasts? If there’s any reason to complain about retiring to Florida, it’s this: with so many options around the state, how do you pick one place to live? There are 372 communities for people 55+ in the state of Florida, so choosing a region can be a challenge. Don’t expect anyone to really feel sorry for you, however. No matter where you decide to settle in, you’ll enjoy the beautiful weather, plenty of recreational opportunities, and some of the best active adult communities in the country. When being close to the coast is important, you’ll need to choose either the Gulf Coast to the west or the Atlantic Coast to the east. Take a look at the benefits of each. On the Gulf Coast, you’ll find some fairly large cities with a lot of history, culture, and art. People retire to the Gulf Coast when they’re looking for a warmer, more affordable version of their hometowns. There are plenty of shows to see, museums to visit, and top-rated restaurants to try. In Sarasota, the Ringling Museum may make you think of the circus. It’s the same family, and there is a circus museum on site, but the real drama is with the museum of art and its dazzling collections of ancient and modern pieces. St. Petersburg is home to the Salvador Dali Museum which showcases the surreal artist’s work and hosts special traveling exhibits. On Sanibel Island, you can visit the National Shell Museum, an interesting look at how shells are formed and where they can be found. The Straz Center for the Performing Arts is the perfect place to catch a musical, ballet, or concert, and tickets cost a lot less than in New York, Chicago, or Boston. On the Atlantic Coast of Florida, there are tons of little beach towns as well as large cities like West Palm Beach, Boca Raton, Fort Lauderdale, and Miami. In the north, retiring to St. Augustine gives you the privilege of living in the oldest city in the U.S. Living near the Canaveral National Seashore is not a bad idea, especially if you like viewing wildlife and launches from the Kennedy Space Center. The barrier island has its own ecosystem, and it’s easy to spot manatees, alligators, and hundreds of bird species. The Merritt Island National Wildlife Refuge is not far from Melbourne and provides a host of opportunities for birding, hiking, and wildlife drives. The Atlantic Coast is also known as a great place to shop. West Palm Beach has CityPlace and a popular outlet mall. In Boca Raton, the Mizner Park outdoor shopping experience is one of the best places to browse, stroll, eat, and even see a movie. Beach Battle: Which Coast Is Better? The best beach experience really depends on what you’re looking for in a coastal community. If you’re planning to learn how to surf during retirement, head to the Atlantic Coast where the waves are bigger. If you’d rather wade into calmer waters, the Gulf Coast beaches have few waves. 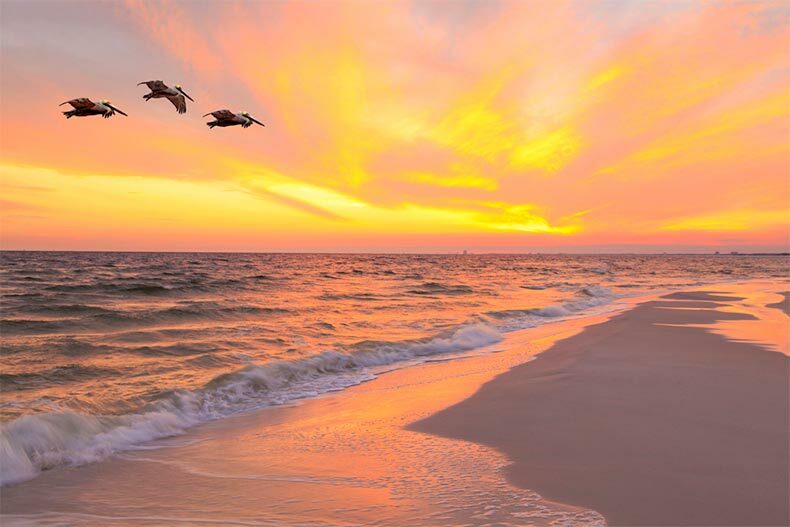 Some of the best Gulf beaches include Treasure Island near St. Petersburg, Bradenton Beach near Sarasota, and Venice Beach to the south. Clearwater Pier is one of the most popular spots on the Gulf Coast for catching a sunset. On the Atlantic side, you’ll find more iconic beaches like Daytona Beach and South Beach in Miami. There’s also Cocoa Beach and its original Ron Jon Surf Shop. If you’re still having trouble deciding whether you want to retire to the Gulf or Atlantic side of Florida, maybe think about your sports allegiances. When it comes to baseball, local teams are the Tampa Bay Rays (Gulf Coast) and the Miami Marlins (Atlantic). Your Gulf Coast football team is the Tampa Bay Buccaneers and on the Atlantic, you’ll either cheer for the Miami Dolphins or the Jacksonville Jaguars. If hockey is your game, you’ll again be choosing between the Tampa Bay Lightning or in Miami with the Florida Panthers. The good news? There’s no bad decision. Whether you choose Gulf or Atlantic, you’re in for a retirement filled with warm winters, plenty of pool time, and a long list of potential 55+ homes for sale in active, neighborly communities.